What goes around comes around. The more things change, the more they stay the same. . . .
As I looked back at 10 years of March issues of the Heights Observer, those familiar and often clichéd sayings kept springing to mind. I kept coming upon articles that covered the same themes and topics contained in this March issue. In March 2009, opinion writer Ralph Solonitz wrote of the near completion of repairs to the University Square garage. Recalling “when the Old May Company on the Heights held rock ‘n’ roll record hops on the parking lot grounds,” Solonitz envisioned a rock concert on the rooftop. In his first State of the City address, the subject of a page one story in this issue, University Heights Mayor Brennan touched on the need for redevelopment of the now largely vacant University Square. We’ve all heard that small businesses have a high risk of failure. As I look back at the 10 January issues of the Heights Observer that we published between 2009 and 2018, I am struck by how many frequent contributors we’ve had—folks like David Budin, who wrote a story for our first issue and whose current column is on page 24 of this one, and Shari Nacson, who wrote her first story for us in 2014 and has been contributing almost monthly since March 2018 (she has two stories in this issue). But out of the 1,450 Heights residents who have created accounts to submit articles in the Heights Observer’s Member Center, many of them are one-time or infrequent contributors—and that’s OK.
After the hustle and bustle of the holidays, January seems quiet and calm. It’s a good time to reflect and set new goals for the year ahead. If you’ve enjoyed reading the Observer in the past, consider contributing a story in 2019. December is the height of the holiday season, when hope and excitement for the future are in the air. The community has processed and pondered the meaning of November election results, with either hope or trepidation for the coming year. For local business owners, the holiday season is make-or-break time. The strength of holiday shopping sales often determines if they will remain a going concern or close up shop come January. The December 2008 issue celebrated the opening of two new businesses in Cleveland Heights: Cleveland Violins at 2917 Mayfield Road and Taste at 2317 Lee Road. Cleveland Heights residents had just voted down an income tax increase proposal, and resident Toby Rittner reported on the various cuts to government services that would result and the need for economic development of “the top of the hill.” In an effort to help local retail businesses, the Heights Observer debuted its first-annual Holiday Gift Guide, a one-page listing of offerings from local businesses. We’ve been celebrating the Heights Observer’s 10th year by looking back—one month at a time—at a decade’s worth of headlines. This month is different; this month we bring you our annual “Shop local for the holidays” guide. Economic impact. Money spent over the Internet effectively leaves the community forever. The same goes for most of the money spent at big box stores. But much of the money spent at independent local merchants gets recycled back into the community, where it continues to feed the local economy. The Heights Observer is a monthly publication; as such, the content of any given issue primarily focuses on the current month. One occasional exception to that unwritten rule is the October issue. In those election years when local issues and candidates are on Cleveland Heights and University Heights ballots, the October edition of the Heights Observer looks ahead to early November, when Heights residents will vote, and publishes a voters guide. Of all the issues, the most difficult was August 2014, which covered the community’s response to the shooting death of Jim Brennan, owner of the Colony on Lee Road. There were layers of grief—for the man, for the business and its employees, and the community itself. In July summer is in full swing and Heights residents are generally thinking about summer reading programs at the library, concerts at Cain Park and outdoor festivals. July also signals the start of the election season as local candidates seek to connect with residents at block parties. The Heights Observer is often fortunate to have the service of college-age interns during the summer, who enjoy writing about the real-world issues our community faces as a means to sharpen their skills and improve their future job prospects. By July 2008 the foreclosure crisis had begun to hit the Heights hard, and the top story in the fourth issue of the Heights Observer told how Heights residents were beginning to organize a response. In “Community addresses foreclosure threats,” Ann McFarland reported on a panel discussion organized by the League of Women Voters to discuss the issue, and Judi Miles wrote “Foreclosure and hope in the Heights,” about how the crisis was affecting the value of homes and her outlook on the future of her neighborhood. In June 2008, the nation was in the worst economic downturn since 1929, and the lead story in the third issue of the Heights Observer told about a group of residents who had responded to deep budget cuts by taking on the cost and labor to maintain hanging baskets and planters that decorated the Cedar-Fairmount gateway each summer. They weren’t alone in considering first impressions: A letter to the editor suggested using the long-vacant “Top of the Hill” parcel at Cedar Road and Euclid Heights Boulevard as a public gathering space, anchored by a well-lit all-weather fountain. With a declining population in the region generally, and in our inner-ring suburbs specifically, it should be no surprise that consolidation was a common theme in the 2008–17 May issues of the Heights Observer. “Four parishes may be one. Merger plan means Saint Louis in Cleveland Heights will most likely close,” was the headline for the May 2008 issue’s top story. Two Cleveland Heights churches, Saint Ann (at Cedar and Coventry roads) and Saint Louis (on North Taylor Road), merged with two East Cleveland churches, Christ the King and Saint Philomena, to become Communion of Saints Parish in 2010. FutureHeights published the first issue of the Heights Observer 10 years ago, on April 10, 2008. To commemorate this 10-year anniversary, members of the Heights Observer Advisory Committee will take a look back at the stories that appeared in the last 10 issues for each month. I get to start us off by looking back at the 10 April issues we have published. We envisioned the Observer as a forum for Heights residents to share information about issues that were important to them. And, many of the issues we were talking about in 2008 we are still talking about, 10 years later. The top story of the April 2008 issue mused about the future of the former Coventry school property. The school district had closed the elementary school in 2007, the building was sitting vacant, and neighbors were concerned about it attracting crime and driving down property values. A group formed to study the possibility of the site becoming an arts center. Today, April 1, 2018, the future of the Coventry property looks brighter as it is rebranded Coventry P.E.A.C.E. Campus and the Cleveland Heights-University Heights Public Library System officially takes possession of it, with the intention of preserving the park, the green space and the building that is now home to several arts and culture organizations. On April 10, the Heights Observer will be 10 years old. When we launched the newspaper 10 years ago, some thought we were crazy. Print was dead; everything should be online. Well, I don’t know about you, but even though I spend a fair amount of time in the digital world, I find the real one much more satisfying; and 10 years in, I enjoy seeing my neighbors holding the Heights Observer in their hands at the local coffee shop. It’s a fiscal affirmation that this community matters. As we approached this 10-year milestone, we wanted to check in with our readers and find out how they thought we were doing. We conducted an online readers’ survey over several months in 2017, received 75 responses, and wanted to share them with you. When you’re involved with running a newspaper you learn there are some things that can never be said enough. No reporters. Every word we publish is submitted by volunteers in the community. If you call me with a great story idea, I’ll tell you the only way that story is likely to get written is if you do it yourself. Contributors are encouraged to write about people they know and organizations they work for. A traditional newspaper would view this as a conflict of interest. We believe it’s useful, as long as any relationship between the author and the subject of an article is disclosed. Congratulations to David Budin, whose column “There goes the neighborhood—again” (June 2016) was awarded 2nd place for general interest columns in the All Ohio Excellence in Journalism competition, hosted by the Press Club of Cleveland. 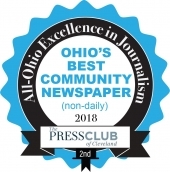 It’s one of the most competitive categories in the contest, which is open to every daily, weekly and monthly newspaper, magazine and news website in Ohio. The first article Budin ever wrote for the Heights Observer appeared in April 2008—the paper’s inaugural issue. Since then, he’s written something for nearly every issue. Much of it has been about the arts—music in particular, which is his first love. Over time, his regular contributions evolved into “Songs and Stories,” a near-monthly column that seems to put a finger on “Heightsness” (my word, not his)—that intangible, defining quality that makes this community unique. Anyone in Cleveland Heights and University Heights who is willing to meet some basic standards of civility is invited to write for the Heights Observer. That means our pages are filled with articles by people who have a personal interest in the events and organizations they’re covering. That’s supposed to be forbidden at a traditional newspaper. But the Observer has never paid for anything it publishes; it couldn’t exist without volunteer contributions. So at the bottom of each article, we run a biographical statement that aims to disclose any pertinent information about the author’s connection to the subject matter. We believe you're smart enough to take it from there. By the first week of November, elections will be over. You’re smart enough to make your own decisions—and the community is too diverse for the small group of us who work on the Heights Observer to have any business telling you what to think. That’s why it’s a core principle of the Observer to facilitate discussion of public issues without taking sides. The Observer doesn't endorse candidates or issues, and we don’t filter out ideas we dislike. Municipal elections are coming up this November. This is the fourth local election cycle that the Heights Observer has been through since its inception, and it, like the ones that have come before it, is an important one. Cleveland Heights residents will vote for three of seven members of city council this year. University Heights residents will vote for four of seven members of council. Residents of both cities will vote for two of five members of the CH-UH Board of Education. In addition, the City of Cleveland Heights has a proposal on the ballot to raise its income tax from 2 percent to 2.25 percent. As I read through this issue of the Heights Observer, I’m excited by how many residents are working to build community in their neighborhoods. On page 5, Susie Kaeser writes about the July 4 parade that she and her neighbors on Compton Road organized. On page 6, Brenda May writes about an impromptu public arts project that appeared in her neighborhood just prior to the Noble Neighbors Community-Wide Open House last spring. On page 7, Art Roby writes about an initiative to support senior residents aging in place by bringing a Village in the Heights to University Heights. At the 2015 FutureHeights annual meeting in April, we asked our keynote speaker, Bill Traynor, this question because at FutureHeights we are committed to building a vibrant and sustainable future for the Heights, and we are launching our new community-building program. Traynor’s answer was simple and intuitive. He said that the first step is to acknowledge that everyone in our community is interconnected and choose to do something about it. Whether we want to be or not, we are all part of this place we call the Heights. We can either choose to build on our connections or try to ignore them and pretend that we are separate and different. We’re having a party. Please join us. On April 22, 6–8 p.m., the Heights Observer is hosting an informal get-together at the Bottlehouse Brewery, 2050 Lee Road. There, you can talk with many of the people who are involved with the Observer on a day-to-day basis—the editor, publisher, volunteers, members of the Observer Advisory Committee and anyone else who walks in the door. The purpose is to have a beer and talk about our favorite subject: our community. Please join us to understand the Observer better, ask questions, float ideas or just chew the fat. Does something about this paper look different? You may notice the appearance of this publication looks a little bit different this month. If you’re not able to put your finger on exactly why, here it is: The columns of type are 1/8-inch narrower than they used to be; and the gutters—the white space between each column—are 1/16-inch wider. Concern about crime in Cleveland Heights is in the air. Some argue the city is falling apart; others say it’s fine. Some say we have too many police and they’re too aggressive; others want to see more on the street. Like so many others, those of us who spend the most time working on the Heights Observer are weary of the superficial and negative coverage our community seems to get from Sun News, Cleveland.com and the Plain Dealer. We’re tired of their police blotter obsession and the habit of putting every news item into the context of decline. The biggest part of the Heights Observer's mission is to enable discussion of important community topics. Who decides what's important? You do, by choosing to contribute. There are some boundaries. Topics must be relevant specifically in Cleveland Heights and/or University Heights. So you can discuss the merits of city council candidates, but we don’t make room for opinions on would-be presidents or governors. There are plenty of other outlets for those conversations. Well into its seventh year, the Heights Observer has achieved a basic level of sustainability—it has repeatable operating processes in place, and brings in roughly the same amount of money each month that it costs to produce. It’s a fragile balance that would fall apart quickly without the efforts of a large group of volunteers and a core of part-time employees/contractors, who perform the daily tasks you can’t expect people to do for free 77 months in a row, and counting. Every month, nearly 10,000 copies of the Heights Observer are distributed at more than 250 locations around Cleveland Heights and University Heights. With the possible exception of The Plain Dealer—which doesn’t provide city-by-city detail of its circulation—no other publication can claim that each issue is seen by as many people in these two communities as the Heights Observer. But the Observer's contributors—community members like you—send in articles all the time, and you don’t have to wait until the beginning of each month to see them. The Heights Observer, a citizen-based publication produced monthly by FutureHeights, welcomes all community news, announcements and information. The Observer was founded by FutureHeights six years ago, for the express purpose of publishing the hyperlocal Cleveland Heights and University Heights news that traditional media outlets tend to overlook. With no full-time staff, the Observer invites and relies on community members—be they residents, or members or employees of Heights organizations or companies—to write and submit articles about the personalities, events and news that is happening in the Heights. Many organizations are accustomed to sending press releases about newsworthy events or causes to media outlets, with the expectation that a reporter will then follow up, call the organization, attend the event, and take the next steps to turn the basic information into a news story. The Heights Observer is intended to be community property—produced by the community, on behalf of the community. One of the main reasons for this column each month is to provide transparency about decisions made while trying to do that job. Yet, while dozens of people contribute to the Observer each month, the handful of us who regularly put in the most time with it make all sorts of decisions that are never likely to be described, explained or even questioned. It’s a small group. While we tend to communicate regularly (mostly by e-mail), we work independently. We often disagree with one another, but we are pretty good at trusting in each other’s competence, respecting each other's roles and making the best decisions we can based on the Observer’s mission. In addition to publishing the Heights Observer, FutureHeights encourages civic engagement by hosting speakers and facilitating public forums. On April 1, FutureHeights will host a public forum entitled “Snow, Sidewalks and Shovels.” In the past, we’ve published articles about keeping our sidewalks clear for pedestrians during the winter, and many residents have weighed in on the importance of doing so given our commitment to being a walkable community. This year, however, record snowfalls have brought the issue to the forefront. How can we keep our sidewalks clear, efficiently and cost effectively? Whose responsibility is it to do so: the homeowner’s or business owner’s, the city’s, or a combination? Join us for a discussion on April 1, beginning at 6:30 p.m., at The Wine Spot, 2271 Lee Road. For the past six years, FutureHeights, the community-building nonprofit organization serving Cleveland Heights and University Heights, has published the Heights Observer. The Observer is, without a doubt, FutureHeights’s most visible—and time-consuming—program. Yet, too often, the connection between the Observer and FutureHeights is lost. The Observer came about six years ago, when the FutureHeights Board of Directors decided that publishing a citizen-driven newspaper was the best way to engage the citizenry and encourage community engagement, and to further FutureHeights’s mission: to promote a vibrant and sustainable future for Cleveland Heights and University Heights through innovative ideas and civic engagement. I’m sure you’ve had plenty of invitations this holiday season. But before you settle down to a more comfortable pace in the new year, let me extend one more invitation: Become an observer in 2014. We welcome submissions from all community members—no previous writing experience is required. The Heights Observer has no writing staff; it exists to publish your stories. The Observer brings people together on important issues. It creates networks in our community and strengthens our capacity to remain vibrant in the future. Consider adding your voice to the diversity of voices in the newspaper. I often hear how much people enjoy reading the Heights Observer and how much they feel it is needed because of the recent contraction in local news coverage by other media. I explain that the Observer is something different—we have no writing staff, and we don’t cover news the way traditional media does; we rely on contributions from Heights residents. We print the articles our residents write and submit—about what they believe is newsworthy. Another thing that makes the Observer unique is the unwavering support of our local business community. Each month, we decide how many pages we are able to print based on the amount of advertising support we have. When we began publishing the Observer in April 2008, we printed 16 pages. We are now able to print 28 pages, and occasionally more, almost every month. The majority of our community’s businesses are independent and locally owned. They know they are reaching you with their advertising, but they also recognize that supporting the Observer is good for the community. In its more than 10-year history, FutureHeights has never endorsed an issue on any ballot. We have often discussed issues and published articles to help inform the public and stimulate civic discourse. In the August Opening the Observer column, our executive director stated that if FutureHeights decided to advocate on behalf of an issue, the opinion would be clearly marked as such. This year, the FutureHeights Board of Directors (FH) debated whether to endorse Issue 81, the school facilities bond issue. The question the board considered was: Should FutureHeights, as an organization, endorse Issue 81? We recognize that a comprehensive school facilities project represents a large investment in our community’s infrastructure, the likes of which we have not seen in 40 years. For the last eight years, FutureHeights has hosted a Best of the Heights contest to help Heights residents celebrate and appreciate the variety of locally owned independent businesses that enrich our quality of life. Each year, a committee of FutureHeights board members meets to select the categories. 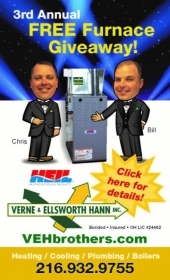 The committee changes the categories each year in order to enable different businesses to win. Over the years, we’ve also tried various methods of ensuring a fair contest. For example, for the past two years, we required that each ballot have at least half of the categories filled out in order to be valid. We hoped that this would discourage ballot stuffing and ensure that people were voting for a variety of businesses in keeping with the spirit of the contest. We also required that each voter provide his or her contact information on the ballot to ensure that a person votes only once. Municipal elections are coming up this November. This is the third local election cycle that the Heights Observer has been through since its inception, and it’s an important one. Cleveland Heights residents will vote for five of seven members of city council this year. University Heights residents will vote for mayor and four of seven members of council. Residents of both cities will vote for three of five members of the CH-UH Board of Education. In addition, a school facilities bond issue, the first since the 1970s, will be on November’s ballot. I am always amazed when I sign in at the Heights Observer’s Member Center—where Heights residents contribute stories and we organize the production of the website, weekly e-news and monthly print edition—and I find a story from a new contributor. Often, it’s someone I’ve never met who brings a new perspective and tells me about something going on in our community that I otherwise wouldn’t know about. We now have more than 800 people who have signed up to contribute to the Heights Observer, and they are essential to our success. With our small staff of a part-time publisher and a part-time editor, we couldn’t possibly produce a newspaper of 24–32 pages each month without the contributions of these volunteers. Our contributors represent all facets of our community. Some are public relations staff employed by our major institutions. Others are the heads of local organizations or volunteers for their churches or neighborhood groups. Still others are engaged citizens with an eye for the news who want to help tell this community’s unique stories. In addition to community members, we occasionally have unpaid interns who gain valuable experience in journalism and community organizing by working with us. We have been fortunate over the past year to work with several students. Recently, someone brought me a copy of the Healthy & Humane Observer and asked, “When did you start publishing this?” The fact is, the FutureHeights is not publishing any other newspapers. Healthy & Humane is one of several geographically-based or theme-based publications started by the Observer Group, but each one of us is independently owned and operated. Is too much good news harming our community? That is the contention of a few critics of the Heights Observer. The stories in these pages don’t seem important enough, or critical enough, in their view. 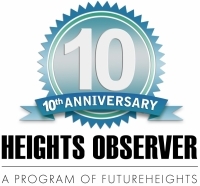 This April, FutureHeights celebrates the fifth anniversary of the Heights Observer, which we unveiled April 10, 2008, at the FutureHeights annual meeting. Too many times, I’ve heard people complain about how the Heights is portrayed in the media. It’s the bad things that get all the press—a string of break-ins occurs in our neighborhoods, a violent “flash mob” erupts during a street festival, a dog is shot in our park. Are these the things that define us? These days, most newspapers are cutting pages or going online entirely, but so far the Heights Observer is bucking the trend. Our pages are growing, not shrinking, and we are committed to our monthly print edition. You can visit our website, www.heightsobserver.org, to see more up-to-date news and sign up to receive our weekly e-newsletter, but many people still prefer to read the news in hard copy form. From day one, we’ve been committed to the print issue because we serve all members of the community, even those who don’t have easy access to a computer. For some, that may be a preference; for others, their modest means may not allow it. Whatever the reason, the print newspaper provides a physical connection to the community. As we start our sixth year of publishing the Heights Observer (the first issue published on April 10, 2008), I’m amazed at how much this little paper—a community-building project of FutureHeights—has grown. I see people picking it up at a local restaurant or bank. I see people reading it. Some even tell me that it is the only publication they read. Why? I ask. The news isn’t particularly timely. It comes out only once a month. But, somehow, it encapsulates more of what our community truly is than any other news source. I think that its authenticity, the fact that it truly is of the community and for the community, is what makes it a good read. The title of this column—Opening the Observer—has always had two meanings for me. The first has to do with transparency, as in opening the newspaper to the scrutiny of its readers. We tell you how we operate (primarily through the work of dedicated volunteers). We state our editorial policy (no political or other endorsements, just the facts). We provide information that affects our community, and a place to air your concerns. The second meaning concerns the contents if each issue—what you can expect to see when you open an issue of the Heights Observer. “And so Cleveland Heights sits on a fragile fault line of demographic inversion. It has its location, its shady streets, and big , comfortable houses that almost anyone would want to live in. And it is afflicted by painfully high taxes, obsolete working-class bungalows, a violence-prone transient population, and schools with a troubled reputation. Right now, the burdens seem to outweigh the advantages.” –Alan Ehrenhalt, The Great Inversion and the Future of the American City. That’s one person’s view of the current situation in Cleveland Heights. Ehrenhalt’s new book examining population shifts in American cities devotes most of a chapter to our city of 46,121 people. A FutureHeights member called the book to my attention. I read the Cleveland Heights chapter first, then went back and read the entire book. Although Ehrenhalt gets some of the details wrong—he refers to Coventry Road as Coventry Street, for example—he may have gotten it right overall. I believe that the health and vitality of our city is fragile, and the reputation of our schools is an important factor. Many people choose where to live based on the availability of strong public schools, whether or not they intend to use them, because schools affect property values. As Superintendent Douglas Heuer said at a FutureHeights meeting last year, he’s never seen a strong community that didn’t also have strong public schools. Other communities may have places where you can walk; but the Heights has places you can walk to. These places are the unique local businesses that line our neighborhood commercial districts, and being able to walk to so many different places—restaurants, grocery stores, coffee shops, bookstores, hardware stores, barber shops and salons—is one of the things that makes living in the Heights so enjoyable. I’ve been writing news stories now for five years, but I still consider myself a nonprofessional. I didn’t train to be a journalist, and never thought I’d end up running a newspaper. Because I lacked professional training, I knew I’d better find some folks who knew what they were doing—and quick. Members of the Heights Observer Editorial Advisory Committee are those folks. They are my go-to group. Whenever I need advice on something in the newspaper biz, usually one of them can help. Much has changed in the Heights this past year. Both Cleveland Heights and University Heights have new police chiefs, our public schools are going through a master facilities planning process, there are new faces on our city councils, neighbors are banding together to form new neighborhood organizations and revitalize old ones, and Cleveland Heights is even giving free parking a try. Positive action through citizen participation is what makes the Heights community such a wonderful place to live. The Heights Observer is your voice in the community, and your voice is important. Through the Observer, you provide information about what is happening in our community, educate your neighbors about the significance of these events and advocate for changes that you think will help move us forward. Soon after FutureHeights launched the Heights Observer in 2008, it developed a partnership with the Heights Chapter of the League of Women Voters, Cuyahoga Area (LWV) to produce the reports of city council, school board and library board meetings that are published in the newspaper. As a citizen journalism project, the Observer relies on contributions from the community, and the reports of this well-respected organization seemed like a natural fit. The Heights Observer has a new editor-in-chief, Kim Sergio Inglis. Kim, who served as an enthusiastic volunteer editor and writer for the Observer for the past several years, is now on board in an official capacity. I am thrilled! As the executive director of FutureHeights, a small nonprofit organization, I wear many hats. When we launched theHeights Observer, in April 2008, we decided to delay hiring a dedicated editor. So the task of coordinating volunteer writers and editors to publish a monthly print newspaper fell on me. I admire people like Adam and Susan Fleischer. By opening The Wine Spot on Lee Road, they have gone all-in on their dream and their community. They’re not alone. For two years I’ve been the volunteer who plugged every new business listing into the Heights Observer’s local business directory. I’m in awe that so many people choose to stake out a future by serving residents of this incredible and quirky area. Almost every day, someone mentions to me how much he or she appreciates the Heights Observer as a positive force in the community. On the days when that doesn’t happen, someone is sure to contact me about an idea they’d like the Observer to pursue on behalf of the community. For those who like what the Observer does, I remind them that it is operated by FutureHeights, a nonprofit organization dedicated to citizen engagement in Cleveland Heights and University Heights. On Tuesday, Oct. 18, a press release arrived at the Heights Observer. It was sent from Hennes-Paynter Crisis Communications, a Cleveland Heights public relations firm representing First Interstate Properties. The press release said that First Interstate—the company behind the controversial retail development planned for the South Euclid parcel of the former Oakwood Country Club—had completed its purchase of the Cleveland Heights portion of the property. The Heights Observer is published by FutureHeights, a community-building organization with 501(c)(3) status, which means that the IRS recognizes it as not-for-profit/tax-exempt. As such, neither FutureHeights nor the Observer are permitted to endorse any individuals running for public office. I mention it now because with municipal elections coming early next month, it is the time when many civic-minded people and groups choose to express their opinions about candidates. The Observer, in its role as a forum for sharing information about the community, welcomes the opportunity to publish those opinions. Here’s the answer to a question that, to my knowledge, nobody has asked: Why doesn’t the Heights Observer run police blotter items? Theft: An Elm Street man reported his 2001 Chrysler broken into sometime between 6 p.m., Aug. 20, and 8 a.m., Aug. 21. His iPod and connector were taken along with his wallet containing, among other things, his driver’s license and a debit card. The man had left his car unlocked. The Heights Observer exists to provide information and air issues of interest to anyone who lives and works in Cleveland Heights and University Heights. With a print newspaper, an e-mail newsletter, a website and a collection of blogs, it is missing one vital element: an online forum where people can fluidly discuss topics of their choice. We initially launched a forum four years ago—when we began publishing the paper. But that forum never achieved the critical mass to take on a life of its own, and participation dwindled. We recently took it offline. In November, four seats on the Cleveland Heights City Council and four seats in University Heights come up for election. The Heights Observer does not make endorsements or recommendations. We do, however, make it easy for anyone in the community to publish his or her opinions on issues and candidates. If you have something to say, please go to the Heights Observer Member Center (http://heightsobserver.org/members/login.php), register as a user, and start contributing. Contributors may include the candidates themselves, a number of whom—since our founding four years ago—have used the Observer’s editorial and advertising opportunities as a strategic cornerstone of their campaigns. One reason FutureHeights began publishing the Heights Observer was to provide an easy and affordable way for local businesses to reach potential customers. This issue of the Heights Observer contains an ad that is likely to raise some eyebrows in the community. You can’t miss it; it’s the largest ad we’ve ever run. The advertiser is First Interstate Properties, the Lyndhurst-based development company that’s planning to develop the former Oakwood Club property in South Euclid and, later, Cleveland Heights.